One of the most immediately recognizable historic buildings in the world, and is a "must see" tourist attraction for visitors to Rome. This being the case, it can become very busy during peak times. The Colosseum is located at the foot of Mussolini's Via dei Fori Imperiali, opposite the Colosseo Metro station. 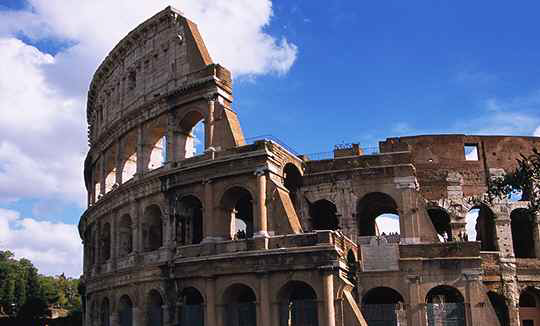 The Colosseum, with originally about eighty entrances, was designed to hold approximately 50,000 spectators. The entrances were numbered, and some of the the Roman numerals above the entrances are still visible. The Roman emperor Vespasian started to build the amphitheatre in 72 A.D. although he died before its completion. It was still not fully finished, when it was opened by Vespasian's son Titus in 80 A.D. with games that lasted for 100 days. The works were eventually completed by Titus's brother, Domitian. The entrances were marked by giant porticoes, over which were gilded horsedrawn chariots. The emperor had his own private entrance, which led under the seats, emerging in the imperial box. Spectators found their way to their seats through numbered arches, although the four main entrances were not numbered. The best seats were on or just behind the podium, located two meters above the arena. The amphitheatre is a vast ellipse with tiers of seating, around a central elliptical arena. The arena itself had a wooden floor, below which was a complex of storage rooms and passageways. Eighty walls radiate from the arena and support vaults for passageways, stairways and the tiers of seats. Around the outer edge, there are arcades and stairways linking each level. 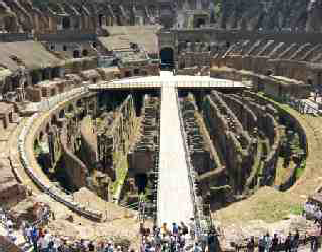 The partial destruction of the Colosseum allows us a view of the basement area of the arena. This was not part of the original design and so was not present when the Colosseum opened, but was added later during the rule of Domitian who was emperor between 81 to 96 A.D. In this confined space, a range of animals, fighters, slaves and stagehands worked in almost total darkness. A series of winches and the capstans would have allowed teams of slaves to hoist heavy objects from the basement to the main arena. Marks from the ropes are still visible in the stone lift-shafts. 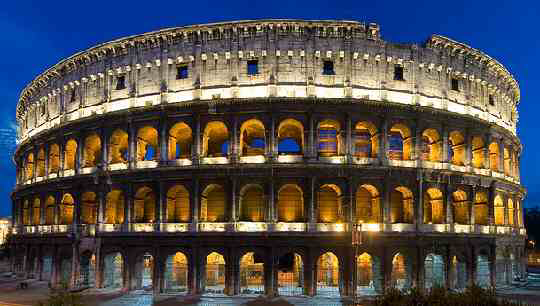 The Colosseum's exterior is created by three storey's of superimposed arches with semi-circular columns. The design of the columns differ on each storey, with Tuscan at the bottom, then above that, Ionic, with Corinthian style columns on the third storey. The higher fourth storey has pilasters decorated with Corinthian capitals. In between the pilasters, are small rectangular windows, above and between the windows are stone plinths, which once held the masts used to support the awnings, which were installed to help produce shade for some of the spectators. If you look upwards, you can still see the holes through which these vertical masts slotted. The construction was a combination of, concrete for the foundations, travertine for the piers and arcades, the lower two levels had for the walls, tufa infill between the piers. Brick faced concrete was used for the upper levels and for most of the vaults.